I first visited Australia on the Thornton-Smith Scholarship in 1982. It was awarded by the Director of Kew Gardens and I spent a lot of time collecting, photographing and documenting the flora of WA. I exported over 450 species as seed and cuttings to Kew Gardens, allowing them to re-landscape the Australian House and display extra species to the Temperate House. I discovered Darwinia polychroma, a new and endangered species. Quite a few photos I took were the first ever recording the flowers of certain species and varieties. On my return I decided to take advantage of London’s warming climate. I removed grandad’s cottage garden of bearded iris, roses and carnations and in their place went an Australian effect garden. Gardeners interested in growing Australian plants will find many growing outdoors at Wakehurst Place, Sussex. Those wishing to create a collection of their own will find Bodnant Garden, North Wales, a good source of species, including Eucryphia (pictured in The Guardian). Certain Australia paper daisies are readily available from general seed companies, like Dobies or Suttons Seeds. Xerochrysum bracteatum has been on the British market for over a century. In good summers, like 1975 and 1976, it was possible to broadcast them direct and harvest seed. In most years this was impossible, so they were sown in cells and transplanted. Conditions were generally too wet to save their seed. Britain’s cold, humid, damp climate meant that I couldn’t even risk placing container grown specimens of Nuytsia floribunda or Grevillea leucopteris outdoors (under glass panes positioned as rain shields) even in summer for fear of fungal attack. The reality of keeping my Australian-effect garden thriving involved a reasonable amount of autumn preparation. It was fun wrapping limbs with hessian, and insulating tree and shrub bases with straw, as insulation against protracted sub-zero winter temperatures. This aspect caused as many enquiries from passersby as seeing the garden at its best in summer. The London climate guaranteed that Callistemon and Lomatia always flowered at the end of autumn. After a warm winter, the Acacia dealbata flowered in March – spectacular! None of the trees and shrubs I grew ever set viable seed, or reproduced by suckering. Active propagation was required to multiply them by cuttings or by purchasing seed. Non-gardeners might find visiting Wakehurst or Kew Gardens and talking to a few experts educational before squealing ‘weed menace’. The inclement climate is the limiting factor for Australian plants, hence highland provenance stock sourced from Tasmania, NSW and Victoria generally have a better chance of survival”. 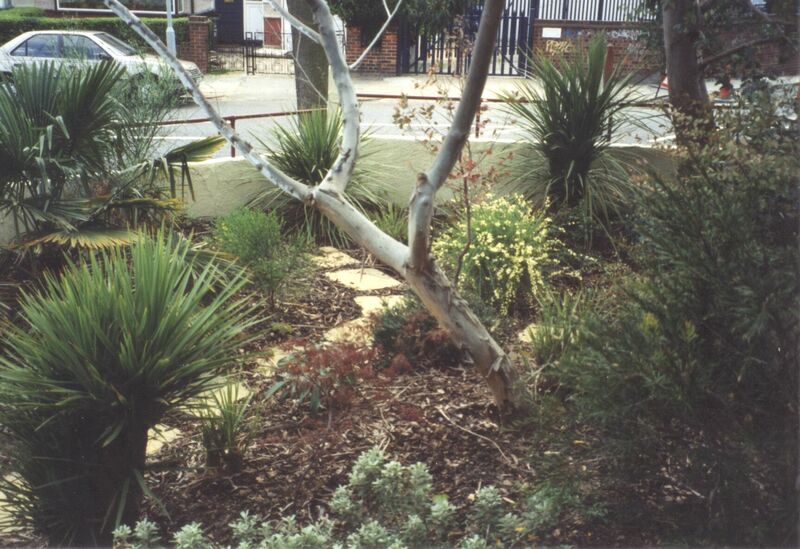 Your Australian garden in London was a joy to behold. The Eucalyptus in particular were gorgeous! Thanks Debbie, you are one of the precious few who would remember! Your Australian effect garden must have drawn some comments in London! Has it been much of a challenge coming to Aus and learning which plants to grow in our sub tropical climate in Brisbane?